The hilltop town of Orvieto lies upon the boundaries of Tuscany, Umbria, and Lazio, near an important drainage divide of the River Tiber that flows to Rome and the River Arno that flows to Florence and Pisa. It is an opportune site for examination of the influence of topography and bedrock geology on city planning, water resources, and life above the floodplains. The “hilltop” is a promontory formed by the erosion into an ignimbrite outflow sheet produced by a pyroclastic eruption from the Bolsano crater, immediately to the west. View from the east side of the cliffs of Orvieto. Gothic facade: bas reliefs recount biblical stories. Alabaster window within the Duomo. Rendering of the original stratigraphy and erosion to create the Orvieto promontory. Pigeon coop within an alcove carved from the volcanic tuff. St. Patrick’s Well – entrance. Huge numbers of caves run under Orvieto- more than 1200 have been identified. all are artificial, man-made, dug over 3,000 years. 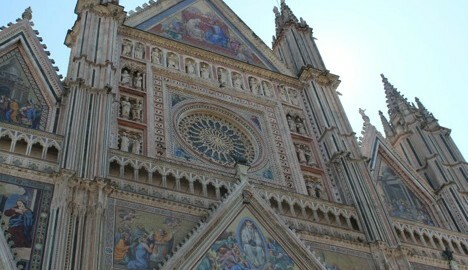 Began with 8th century BCE Etruscan settlements at Orvieto. Readily fortified but without a surface water source, the ancientn Orvieto needed water so the Etruscans dug deep shafts through the tuff layer down to a water source above the “aquitard” of marine clays, below. They also created cisterns for rain water and connected the cisterns via a network of tunnels. Periodically Orvieto was attacked and destroyed by the Romans. Another cave area was a quarry for cement mortar. We have a document from 1882 referencing a request to exploit the quarry; permission was granted 4 days later. Also visit an Etruscan well shaft that was turned into a dump when they did not find water. In excavation, 6th century BC rooftiles were found in it. Shaft was 25 m deep when it ends. Water was probably close to 80 m deep. How did they breathe? served as a “storage” area for food if the city was under siege. Pigeons are delicious, and are still considered a local delicacy. 1632 passages for the pigeons in and out of the cave were closed by Pope Urban VIII. Probably for reasons of tax evasion as the gates in/out of city were taxed and these passages were ways to slip in. Consolidation of the caves took place in a campaign from 1975-2000. Further action will be taken in 2015, as the problem is ongoing. Mosaic program: Annunciation, Baptism of Christ, Apostles, father and mother of Mary, miracle of the Virgin birth. Mosaics originally date to 1354-1380 but portions have been restored over the years, leading to an intriguing mixture of styles that still contribute to a cohesive iconography. Questions of typology: how do you build a new religion from an old one? art is NOT the Bible of the poor. Must take into consideration historical and ahistorical readings of art. We also should consider performative functions of the façade during processions, festivals or other activities. chapel was begun in mid 15th century (decorated by Fra Angelico). He abandons the project in 1470s. Signorelli takes over in the 1490s. The decoration of the chapel makes tangible the very real stakes of the Eucharist. del Monaco et al., “Field Guide to Orvieto, Civita de Bagnioreggio, & Ancona,” 2nd World Landslide Forum, 2011, pp. 1-17. Morello N., “Steno, the Fossils, the Rocks, and the Calendar of the Earth,” in Vai GB et al., The Origins of Geology in Italy, GSA Special Paper 411, 2006, pp. 31-42. Four-stage geological evolution of Orvieto.